Bearing plates give greater bearing surface than standard-cut washers, and help distribute the load at these critical connections. The BP1/2-3 and BP5/8-3 are 3" x 3" bearing plates that meet the latest requirements of the IRC and IBC. These plate washers are available uncoated or with a hot-dip galvanized (HDG) coating. The BPS and LBPS are bearing plates that offer increased flexibility while meeting the latest requirements of the code for 2x4 and 2x6 walls. The slotted hole allows for adjustability to account for bolts that are not in the middle of the sill plate. The BP5/8SKT uses 1/4" x 1 1/2" Strong-Drive® SDS Heavy-Duty Connector screws to provide lateral resistance when 5/8"-diameter sill holes are overdrilled (screws are provided). The shear capacity of the connection and the sill/anchor bolt shall be determined by the Designer for each installation. LBP, LBPS — galvanized; BP7/8-2, BP5/8S — zinc plated; BPS, BP — none. 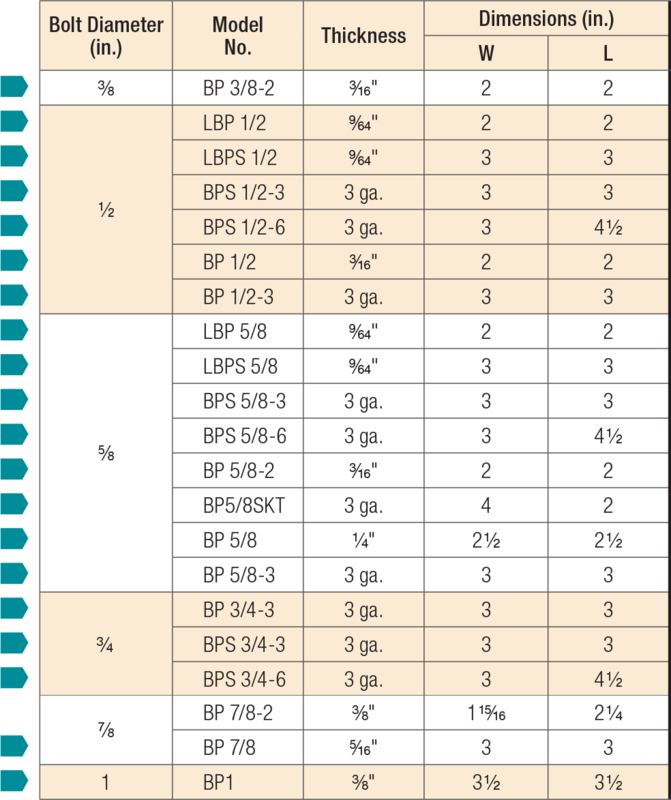 BPs and BPSs may be ordered HDG; LBP and LBPS products may be ordered ZMAX®; contact Simpson Strong-Tie. See Corrosion Information. BPs available in black powder coat; add PC to model number. BP/BPS — For shearwall applications, position edge of plate washer within 1/2" of sheathed edge of sill plate. BPS-6 plate washers are sized to accommodate the 1/2" from the sheathed edge in single- and double-sheathed 2x6 walls. Standard-cut washer required with BPS slotted bearing plates. Washer not required when used with Titen HD® heavy-duty screw anchors. BP5/8SKT sold as a kit. Standard-cut washer required with BPS 1/2-3, BPS 5/8-3, BPS 3/4-3, BPS 1/2-6, BPS 5/8-6, and BPS 3/4-6 (not provided) per the 2012/2015/2018 IRC and 2015 SDPWS. BP See specific model numbers for code listings. BP 1 No evaluation report listing. BP 5/8 Prescriptive code: Products which meet prescriptive code requirements. BP 5/8SKT Prescriptive code: Products which meet prescriptive code requirements. BP 7/8 Prescriptive code: Products which meet prescriptive code requirements. BP 7/8-2 No evaluation report listing. BPS 1/2-3 Prescriptive code: Products which meet prescriptive code requirements. BPS 1/2-6 Prescriptive code: Products which meet prescriptive code requirements. BPS 3/4-3 Prescriptive code: Products which meet prescriptive code requirements. BPS 3/4-6 Prescriptive code: Products which meet prescriptive code requirements. BPS 5/8-3 Prescriptive code: Products which meet prescriptive code requirements. BPS 5/8-6 Prescriptive code: Products which meet prescriptive code requirements. LBP See specific model numbers for code listings. LBP 1/2 Prescriptive code: Products which meet prescriptive code requirements. LBP 5/8 Prescriptive code: Products which meet prescriptive code requirements. LBPS No evaluation report listing. LBPS 1/2 No evaluation report listing. LBPS 5/8 No evaluation report listing.